Researchers have developed lightweight supercapacitors that, when combined with regular batteries, dramatically boost the power of an electric car. The supercapacitors, a “sandwich” of electrolyte between two all-carbon electrodes, were made into a thin and extremely strong film with a high power density. The film can be embedded in a car’s body panels, roof, doors, hood and floor. It will store enough energy to quick charge an electric car’s battery in just a few minutes. 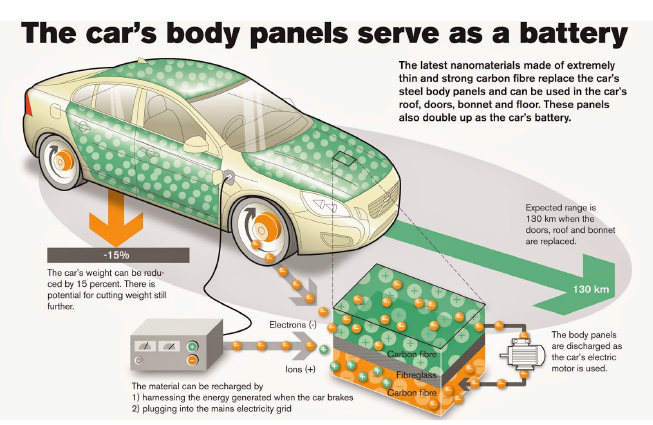 The findings, published in the Journal of Power Sources and the Nanotechnology journal, mean a car powered by its own body panels can be a reality within five years, Mr. Notarianni, PhD researcher Marco Notarianni, from QUT’s Science and Engineering Faculty said. “Vehicles need an extra energy spurt for acceleration, and this is where supercapacitors come in. They hold a limited amount of charge, but they are able to deliver it very quickly, making them the perfect complement to mass-storage batteries,” he said. Postdoctoral Research Fellow Dr Jinzhang Liu said currently the “energy density” of a supercapacitor is lower than a standard lithium ion (Li-Ion) battery, but its “high power density,” or ability to release power in a short time, is “far beyond” a conventional battery. “Supercapacitors are presently combined with standard Li-Ion batteries to power electric cars, with a substantial weight reduction and increase in performance,” he said. “In the future, it is hoped the supercapacitor will be developed to store more energy than a Li-Ion battery while retaining the ability to release its energy up to 10 times faster — meaning the car could be entirely powered by the supercapacitors in its body panels. The technology would also potentially be used for rapid charges of other battery-powered devices, Dr. Liu said. “For example, by putting the film on the back of a smart phone to charge it extremely quickly,” he said. ‹ PreviousWill Lawmakers Find Compromise on Alimony Reform? Next ›What is a Barcode Scanner?